Sixteen Spartans. One Longsword fighter. No supervision. Lots and lots of weapons. That's all you need to know. - The Scorpion should not be enabled in competitive situations, especially CTF. Due to quirky collision (and a lack of planning on my part), it's possible to "periscope" the cannon up through the floor of either red or blue base and fire. - It's possible to cram a Warthog or Ghost up through the base interiors and onto the landing pad area. Not practical in a competitive situation, but it is doable. If you have a question or a comment, you can contact me at the e-mail address listed at the top of this file. I have no problem sharing knowledge or tags. I don't generally respond to IMs from strangers, but if you want a response, please state your business up front. Do not type in "Hey" and expect me to respond. I'm too old and intraverted for casual conversation. Special thanks to staticx57. All the people in the community that have been supportive and friendly to me. Nick03, Katana, Digikid, Nick2345, dsacasa20, TheMissingLink117, infin81ne, cool people, one and all. And a bunch more people who I respect, but haven't had the opportunity to speak with directly. 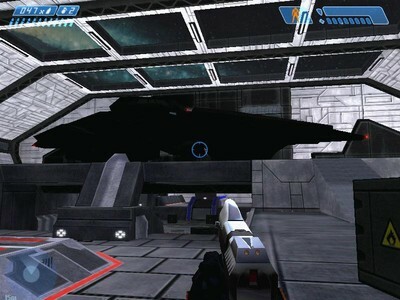 Halomaps.org and halo-universe.com for hosting the original Launch Bay (and hopefully this one, too). Gearbox and Bungie. And, of course, if you took the time to read this and download the map, thank you.